i just posted a comment and it showed how many posts I've made, I like it, but I was wonder why the others in the screen shot don't have it? Huw just implemented it. 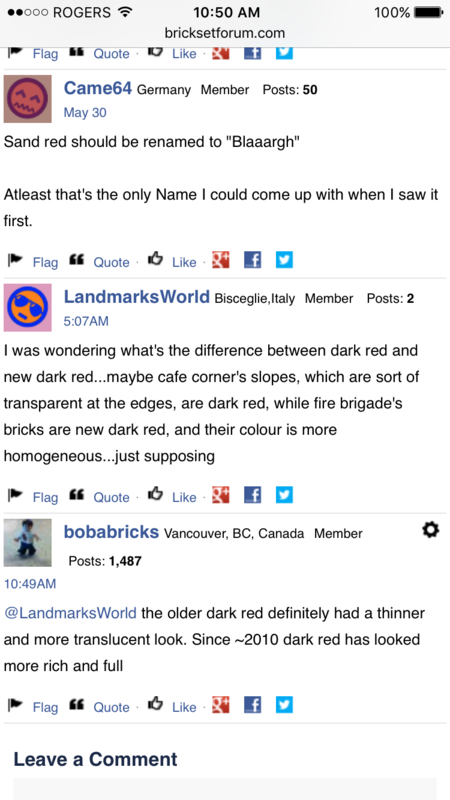 It's mentioned in the Eurobricks open letter thread. OOOHHHH I see, my location is just too long. ;P the other's are in the corner there. Huh. I hope this wasn't a result my self-aggrandizing request for a 'likes' career tally? I enabled the plugin to see if it was any use. I await your feedback. Seems unnecessary, but inoffensively so, to me. I am not bothered by this either way. I am sure others like it so happy for it to stay. Not bothered either way for me, but it does highlight new posters for the marketplace thread - maybe adds another (small) layer of protection from scams? I would have thought you would have been all for this as adding the comments and discussions together puts you at a higher like ratio than @samiam391. ^This is true - as I am very prudent about posting new discussions. Any Forumetrics that I can point to to substantiate superiority are always welcomed. This seems to have removed the 'member since' indicator though which was also interesting. Now I need to see how many I have lol. @Goldchains I've seen quite a few where it's new poster, general, frequent, so on and so on. Quite low, but more than I thought. Bet half of those are in the mocs thread. I'll stop pointless count increasing now. You guys realise you can just check your post count on your profile page without posting? ^ And more to the point, the number of posts really isn't important. It's the quality of the posts! I agree. I have 514 posts and 385 likes. It's not about popularity or quantity, it's about bringing something useful to the table. I'm more about the humor side rather than sage advice or nonsensical babble. I'm sure of you so a deal with sometime you look on their page and see since when they've been a member, how many posts isn't that important. Someone might only post sparingly but still be an active member. And like @SumoLego said the ratio is what counts - how about putting in a formula for that ;) I'm only kidding, don't think this forum should be a popularity contest but just somewhere where everyone feels at home no matter how much they say. It's definitely not a popularity contest immediately after I get 10k likes. I have also noticed that most of the comments on my wall have disappeared. I like having these as opposed to the "feedback" thread. I have had many transactions on here, but now it inly shows I have only 3. There has to be a way to implement a feedback system on member's walls. If "likes" mean that you are popular on this forum then I am very popular, but we all know is the furthest from the truth. Another forum I'm on uses VBulletin but they have integrated something called iTrader to record and display user feedback for merchandise transactions. Maybe something similar exists for Vanilla Forums.